A man's chances of survival depended on how quickly his wound was treated. Modern warfare was now producing vast numbers of casualties requiring immediate treatment at the same time. This necessitated an efficient system that could immediately address a patient's critical injuries close to the Front and then evacuate him to a medical unit in a safer zone. This network is known as the Medical Chain of evacuation or evacuation chain. The secret of success in treating large numbers of casualties was rapid evacuation. "All through the chain of Medical Units from the Front to the Base the wounded man is kept the very minimum of time to attend to his wounds, and then he is moved on, and kept on moving, until he reaches either the Base or Home..... The reason for rapid evacuation is twofold. Firstly, it is very bad for morale if troops see wounded men lying about in large numbers; and, secondly, unless Medical Units are cleared they lose their mobility, and also cannot deal with a fresh influx of wounded that might come in quite unexpectedly - e.g. from a surprise counter-attack." The rapid and successful evacuation of any casualties, whether on a battlefield or in civilian life, depends on three interdependent factors - time, space and transport. Time involves how quickly wounds receive first aid so infection does not set into the wound, and/or the casualty does not bleed to death. It also involves how quickly the casualty can get to someone with specialized knowledge or with specialist equipment. Abdominal wounds, for example, need to be operated on within six hours in order for the patient to survive. Transport involves what type of equipment can be used and/or is readily available to transport the casualty away from danger and to an appropriate medical facility. This process could involve the soldier walking or being transported on stretchers, horses, cars, trains, barges or ships. Space involves what is happening in the immediate area such as: how close can emergency services get without becoming casualties themselves? What is topography and how does it help or hinder? Is there enough space to set up a large medical facility close by or is there only enough room for a small one? - Mobility: All medical field units needed to be able to move at a moments notice. This was essential to ensure the fighting units had medical support during an advance or retreat. The procedure for a significant advance was for each medical unit to move forward to one already up and running in front of them. Therefore, the Regimental Aid Post would move forward in line with the fighting soldiers. 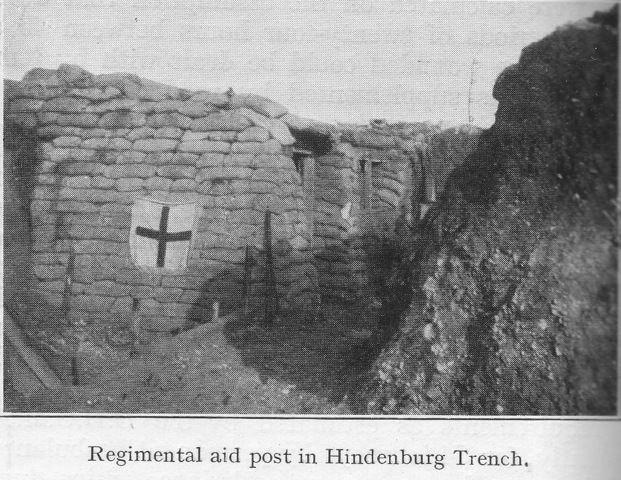 An Advanced Dressing Station would then move forward to a Regimental Aid Post. The Main Dressing Station would move forward to an Advanced Dressing Station. A Casualty Clearing Station would move forward to a Main Dressing Station, and a Stationary Hospital would move to fill the gap between the Casualty Clearing Stations and the General Hospitals near the ports. In a retreat the procedure would be same but in the opposite direction. This was achieved by a small 'light section' of each unit moving forward immediately. They would provide care for the serious cases still housed in the unit ahead who were unable to be moved. The rest of the unit would then evacuate less serious cases, then would close, pack up and move. - Overlapping areas: During a major offensive, the front Line might cover some 5 to 6 miles with many Corps/Brigades/Regiments involved, all of which would have had their own pre-allocated medical support. In situations where the areas of advance were narrow, it was inevitable that their medical support would overlap. In these cases medical units from different Divisions would either work together as one, or perhaps two or three different medical units would set up in one specific location. - Co-Operation: It was imperative that the medical evacuation chain did not hinder the fighting troops going into action or prevent them from getting to their ammunition, and vise-versa. Also the Medical Services was reliant on other branches of the army to supply materials to build Dressing Stations, construct roads, railway sidings, and/or provide telephonic communications. - Before the start of any major offensive the Directors and Assistant Directors of Medical Services (DMS and ADMS) who were appointed to oversee in the offensive held a conference to discuss all the above factors before setting up the evacuation chain for that sector. "I should not advise anyone with any desire to practice their surgical or medical skill to take on the job of medical officer to a battalion, but from the point of view of seeing the war, understanding military methods and the spirit of the men it is the best post open to a medical man..... The only diseases the M.O. is called upon to treat are slight sprains, myalgia, and last, but not least, diarrhea.... Sanitation is, perhaps, the most important work that the M.O. is called upon to perform." Duties of the RMO: During the war every fighting unit (infantry battalion, artillery brigade or cavalry regiment) had it's own doctor [or RMO]. He was RAMC but came under the commanding officer of the fighting unit he was attached to. The doctor's role was not only to attend to medical matters but also matters of hygiene, which meant water supply, the preparation of food, and the supervision of sanitary areas all came under his control. The doctor's daily routine usually began with him doing an inspection of the sick. He then inspected the camp or billets, and the cook houses. The rest of the day would be taken up with the training and supervision of water cart orderlies and stretcher-bearers. To assist him in his duties he would have had an RAMC Sergeant or Corporal attached to him and perhaps 1 or 2 RAMC Privates. When away from the Front Line, the doctor's post was known as the Camp Reception Station [CRS] or Medical Inspection Room [MI Room] and contained 2 - 6 beds for short term holding for those needing rest but was not sick enough to be evacuated back. "A good M.O. to a battalion was a privileged and important officer. He was usually on intimate terms with his colonel, a friend to all his brother officers, and friend and confidant as well as doctor to the rank and file. Often and often I noticed that a battalion with a first-class M.O. was always a first-class battalion, had the smallest sick parade, fewer men falling out on a long march and the lowest quota of casualties from trench foot." Function of the RAP: When in the trenches the doctor's post was the RAP. The objective of the exercise was to patch up the wounded and either return them to their duties in the line or pass them back to a Field Ambulance. The RMO had the same staff as mentioned above but this became augmented by a designated number of Stretcher-Bearers. These Regimental Stretcher Bearers came from the fighting unit the RMO was attached to, usually the regimental bandsmen. 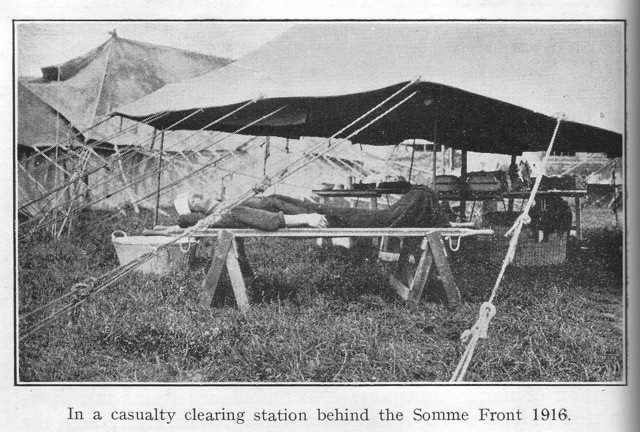 When under pressure, the RMO could be further assisted with bearer teams from a Field Ambulance. Every soldier had a special pocket in his uniform for his issued 'First Field Dressing.' It contained antiseptic pads and two bandages (one for entry wound, one for exit) in a waterproof cover. This dressing was applied by a regimental stretcher-bearer, a comrade, or by the wounded soldier himself, if he was able, in the firing line. If the wounded man was unable to walk, he was carried back via hand or wheeled stretcher to the RAP. The regiment stretcher-bearers had then fulfilled their duty, and it became the RMO's responsibility for receiving the wounded man, and treating him by checking the dressing, overseeing the splinting of fractures, and ensure everything was being done to stop the patient going into shock. If morphine was given or a tourniquet applied, the soldier's forehead was marked with a "M" or "T". If required he would undertake an emergency amputation but large operative treatments were discouraged so close to the fighting and danger. The RMO also completed a Field Medical Card for each patient and fixed it firmly to the patient�generally attaching it to a button by its attached string. This card included the soldier's name, rank, and unit, a diagnosis, and any special treatments (like operations) performed. As the patient moved down the evacuation chain, the Field Medical Card remained with him so that information could be added to it and his full treatment could be known. The patient was then taken to a designated collecting area to be picked up by stretcher-bearers of the Field Ambulance. Equipment: According to Dr John S G Blair "The basic MO's drug box in 1914 included phenacetin for headaches, Adrenaline in injectable form, 0.0003gm, one dose to be used as a stimulant.... Dover's powders for colds, Bismuth salicylate for the stomach, cough medicine, a light aperient calomel, and a strong one, unspecified; quinine sulphate, 2gr (60mg) as a tonic, lead and opium tablets to be made into a lotion as an application for sprains or as an anti-diarrhoeal and, for the doctor to hold safely, morphine sulphate gr 1/4 or grl 1/2 (15 or 30mg). Morphine was to be given "under the tongue or by injection." There were also methylated spirits, iodine, boric lotion and carbolic acid 1 part in 60 as antiseptics for wounds, Lastly there was sal volatile, to be given for 'fainting, a few drops in water'." [Dr John S G Blair 'Centenary History of The Royal Army Medical Corps]. 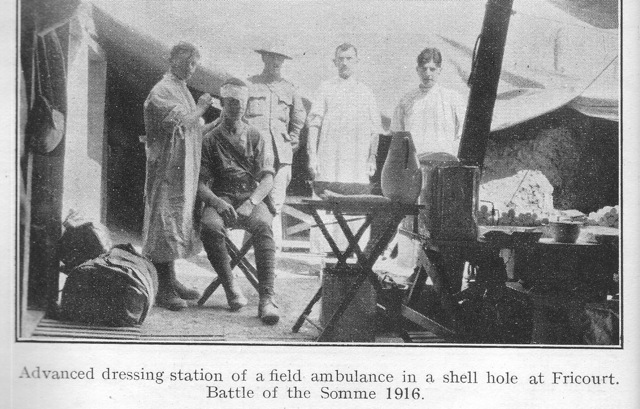 Equipment at the RAP was supplied by the Field Ambulances and normally consisted of a primus stove and a beatrice stove, along with an acetylene lamp, anti-tetanus serum, assorted bandages, blankets, Boric ointment, cotton wool, first field dressings, plain gauze, shell dressings, Sulphur ointment and a vermoral sprayer. There was also reserve boxes of all of the above, and a hamper containing medical comforts such as brandy, cocoa, bovril, oxo, biscuits etc. Location requirements: The site of the RAP came under the concern of the officer commanding the fighting unit. It was ideally situated a few metres behind the front line, but near the regiment's headquarters so the RMO could be provided with early information about the tactical situation. It was also to be located central so it could be easily accessed from any part of the front line in which the regiment is engaged by the wounded. Also in a place that was sheltered to protect all from enemy fire, and easily accessible to the field ambulances who were next in the line of evacuation. 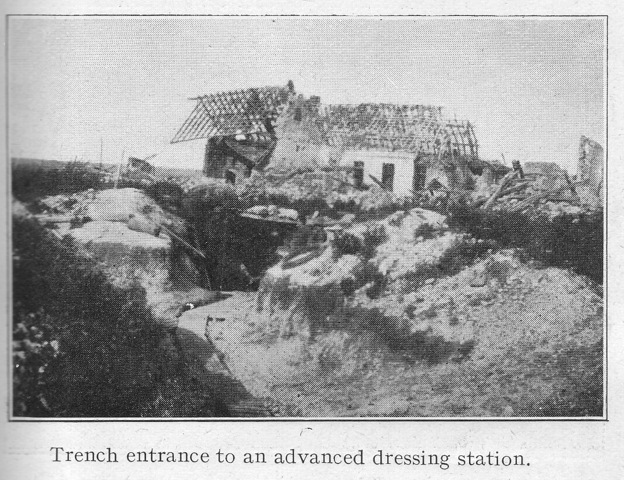 Typical facility: RAP's were usually situated in a dugout, in a communication trench, a ruined house, or a deep shell hole. In areas where constant fighting had occurred over a long period of time, such as Ypres, there was very little cover left so a RAP might have been set up behind a burnt out tank. RAP's had no holding capacity for the wounded. If the engagement was successful then the RMO moved forward and searched out another area which would come into the above criteria. A yellow flag was put up so that the wounded could find it and runners might be expected to run back to advise the ADMS and the Field Ambulances of the new location. Transport: The RMO was equipped with a horse for his personal use, and a Maltese Cart (a two-wheeled cart suitable for conveying a lying patient) and driver. Alternatively these might have been a light motor van and a small motor-car or a motor-cycle combination. As noted above the RAP would have stretchers for hand carriage and/or wheeled stretchers. The Field Ambulance was a complete medical unit made up of previously separate and independent entities. These were The Bearer Division [previously working as Bearer Companies]; The Tent Division [previously working as Field Hospitals] and The Transport Division [Army Service Corps (to be explained further in the Transport of Sick and Wounded section)]. The Field Ambulance at full strength composed of 10 Officers and 224 men. 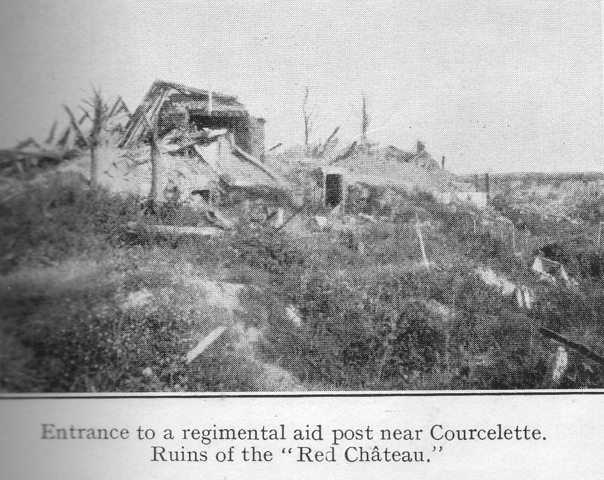 The Bearer Division had 18 stretcher squads each of 6 men. The Tent Division was comprised of doctors: 9 medical officers and 1 dental officer, as well as 1 Quartermaster of stores, batmen, clerks, cooks, dispensers, nursing orderlies, and the Transport Division, which had 60 men attached from the Army Service Corps. All this made up medical support for one infantry brigade. [Three to every Division]. Each brigade was made up of three to four battalions, so in order to perform it's duties satisfactorily, the field ambulance was divided into A, B and C Sections These three sections were all capable of carrying out independent action. The headquarters of the Field Ambulance always formed part of 'A' Section. The three sections were further sub-divided into three parts to incorporate the bearer division, the tent division and the transport division. When away from the trenches a field ambulance's role was to keep the fighting men fit and healthy. This was achieved by setting up Divisional Rest Stations [DRS] and baths (usually sited in a Brewery where up to 50 men could be bathed at a time in the large vats). They were also allocated special tasks such as providing treatment at scabies centers or other ailments. When in the trenches its role was similar to modern day emergency ambulance services: to collect and transport patients to someone with specialized knowledge or to specialist equipment, whilst monitoring them, and treating them if necessary to ensure their condition remains stable. The personnel serving in the field ambulance achieved this by setting up various designated posts and sections according to distance from the RAPs to the Casualty Clearing Stations. The Bearer Division were the stretcher-bearers responsible for collecting the wounded, whilst the Tent Division were the medical staff responsible for the treatment of their wounds. 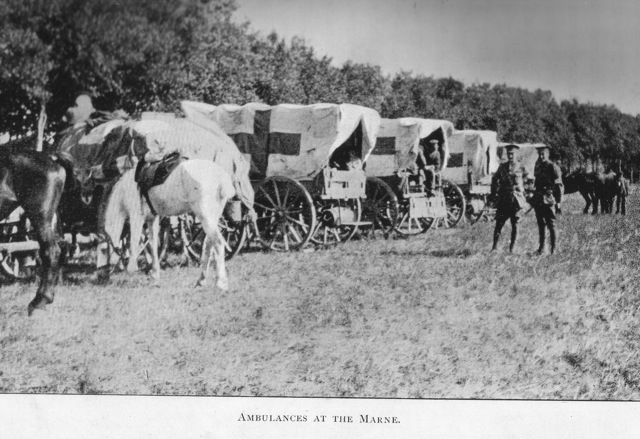 Before any major offensive, the three Field Ambulances of a Division joined together and acted as one to form and oversee the various posts and stations. One way of knowing how the field ambulances were arranged for any particular battle is to look at the war diary of the ADMS of that Division. Location and Construction: There were normally two ADSs to every Division. In areas where the Divisional line became narrow one ADS would be established for the sole use of that Division and one would be shared with the Division to their left or their right. ADSs were set up as far forward as military conditions would permit. Ideally, this was about 400 yards behind the RAPs. Preferable locations were large houses, schools or churches but tents were used where necessary. In all events they needed to provide living accommodation for the officers and men; shelter from the weather; be inconspicuous and provide protection from the enemy, and had to be easily accessible with an entrance and an exit. The personnel of each ADS were 3 officers and 53 ordinary ranks. Of these 1 officer was the Officer Commanding. 36 Privates would be employed as stretcher-bearers, with 1 officer supervising them. The others would be employed as clerks, dressers and cooks. If the ADS became overwhelmed with casualties the above personnel could increase. Typical equipment for the ADS included stretchers, notice boards and flags for marking routes, empty petrol tins for water and kettles, hot water bottles, acetylene lamps, blankets, ground sheets, pyjama suits, stomach warmers, anti-tetanus serum, chloroform and No 1 Field Pannier, which included: wool, gauze, plain lint, shell dressings, 3 and 6 inch and triangular bandages, a jaconet and a calico, towels, nail brushes, safety pins, plasters, towels, tourniquets, a tincture of iodine, rum jars filled with eusol, and splints for leg and back as well as the Thomas splint. The ADS was the first line of documentation for the RAMC, [i.e. Admission and Discharge books, war diaries etc]. Stretcher-bearers went forward and collected the sick and wounded from the RAP and carried them back to the ADS. A patient's medical condition was then assessed to make sure bandages had not loosened or become too tight, and also that the patient was not haemorrhaging or going into shock. Special attention was given to those marked with a "M" or "T" (morphine or tourniquet) at the RAP, and careful examination was given to see if the tourniquet needed to remain or not. Surgery was not undertaken at an ADS unless absolutely necessary as it had no holding capacity. It was simply an intermediate stop to assess the patient. Those who were deemed to be urgent cases were transferred to the Main Dressing Station. Those who were not deemed as urgent cases were transferred straight to the Casualty Clearing Stations. "It was now eleven o'clock of a pitch black night with threatening rain... We were in for a busy night, for all the stretcher parties from the various ambulances were out in the field collecting the wounded, whose arrival was expected now at any moment. An operating tent had been pitched in the field near by, and was brilliantly lit up with a huge acetylene lamp. The operating table was fixed in the centre of the tent and along each side were the instruments, basins, and dressings lying on the lids of the panniers, which made excellent side-tables. Very soon the ambulances lumbered up with the men picked up from the fields close at hand. The stretchers, each holding a wounded man, were taken out of the waggons and laid on a heap of straw near the door of the operating tent. Sixteen men were taken out and laid side by side. New Stretchers were put in the waggons, which again set out to bring in more wounded. One surgeon stood on one side of the operating table, another stood opposite him, and a third surgeon was ready to assist or give an anaesthetic if necessary. Quietly and quickly one wounded man after another was lifted on to the table, his wounds were speedily dressed, and he was again carried out and laid on the straw with a blanket below and another above him. Those with painful wounds were given hypodermics of morphia. All who were fit to take nourishment had hot soup, tea, bread and jam. Stimulants were given freely to those requiring it. The wounds were mostly from shrapnel, and only one case required an anaesthetic. He had a bad compound fracture of the thigh and was in terrible pain. We made some good splints and fixed up the limb comfortably and in good position. One poor devil had a bad abdominal wound for which we could do nothing. He was given a good dose of morphia and slept quietly till five a.m., when he ceased to breathe. At one o'clock in the morning wounded were still coming in, and the surgeon on duty was relieved by myself. So with coat off, bare arms and covered with an operating apron, I did my spell of surgical duty during that night on the banks of the Marne. Our stretcher parties at last were finished, and had all come in with the report that all wounded had been brought in...... At six o'clock our large list of wounded were sent off the railhead at Coulommiers on returning-empty supply waggons and under the charge of a medical officer. The operating tent was struck and all the panniers and equipment were packed. The Field Ambulance had done its 'job'." There was normally one MDS to every Division. They were formed by the Headquarters of the Field Ambulance [section A]. Ideally MDSs were sited roughly one-mile behind the ADSs. But in the Great War this was seldom the case, partly due to topography, but also because a MDS needed approximately 300 X 200 yards of space to provide sufficient room should it be taken over by a Casualty Clearing Station during an advance. The ideal location was a large building where water, light, heating and drainage were already supplied. If no buildings were available, then roughly 9 tents were used, with 1 reserved as an operating room. MDSs needed to be located between the ADS and the Casualty Clearing Stations, closer to the latter if possible. They did not need protection from shell fire, but cover from the splinters of bombs had to be taken into account. 1) Receiving Section provided hot drinks, sandwiches, and cigarettes. 3) Resuscitation Section for warming and reviving those suffering from shock or the effects of haemorrhage. 4) Dressing Station where dressing were applied, and any urgent surgical treatment, administration of A.T.S. or morphia, if not carried out already. 5) Gas Section to keep gas victims away from other patients. 6) Evacuation Section where the patient's treatment was classified with whatever they were suffering from and how they were treated, and they awaited evacuation. 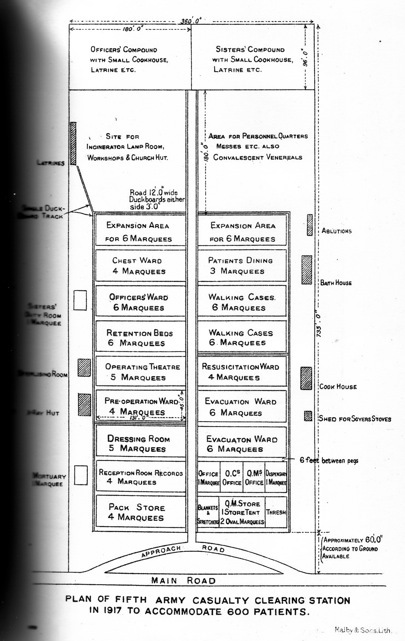 Other space was allocated for a mortuary, a cookhouse, stores, and living accommodation for officers and others ranks. Personnel: The personnel of each MDS included the Officer Commanding, 2 Medical Officers, a Dental Officer, a Quartermaster and 59 other RAMC ranks, along with 1 Royal Army Service Corps officer, and 44 other ranks ASC attached. Equipment: Typical equipment at the MDS was very much the same as the ADS, with additions of oxygen apparatus, operating lamps collapsible trestles and a field dental outfit. Duties: The MDS was further away from the firing line so was able to be better equipped to provide accommodation and treatment than an ADS. Urgent operations were more readily performed, and better arrangements could be provided for the resuscitation of those suffering from shock or haemorrhage, or both. During a major offensive the ADS quickly became congested. If it were pre-judged that this was likely to happen, then a WWCP was set up - one to every Division. It was generally believed that the walking wounded were able to walk slightly farther than the ADS, therefore a WWCP was often constructed at a location between the ADS and the MDS. Location: Ideally, a WWCP was sited with easy access from the front line and the ADS, and also close to a road leading to a Casualty Clearing Station so that transport could reach it. The route was set up close to the stretcher-bearers' route in case the walking wounded man collapsed on his way to the WWCP. The route from the Front to the WWCP was clearly marked with notice boards or directing flags. The Post would have been sited behind the usual range of artillery fire but protection from splinters was accounted for it when a location was being formed - usually in a building or farm house but marquees were also used. Personnel & Equipment: The WWCP was staffed by personnel from a Field Ambulance section, but there were no specific arrangements, and there was no scale laid down for equipment. A suggested guide for equipment was 5 Thomas Splints, stretchers, blankets, waterproof sheets, soyer's stoves, camp kettles, petrol tins for water, drinking mugs, and one medical companion and first medical panniers (pairs). Also dressings and light refreshments for approximately 300 cases. Structure: Similar to the MDS, the WWCP consisted of a Reception Section, a Recording Section, a Dressing Section, and an Evacuation Section. No operations or complicated dressing were done at the Posts. When leaving the Post, the wounded men were transferred to the MDS or the Casualty Clearing Station, whichever was deemed appropriate. At times when it was impossible to get the ADSs optimally close to the fighting units due to unsuitable topography for motor transport, bad weather, or deteriorated land due to heavy shelling, the field ambulance set up relay posts. It was acknowledged at the time that bearers could not carry loaded stretchers more than half a mile over difficult ground, meaning that a relay post would be set up roughly every half a mile. There were no medical facilities set up at relay posts, they merely existed so that stretcher-bearers could pass their carry to the next set of stretcher-bearers and then return to the RAP to pick up new casualties needing to be carried. 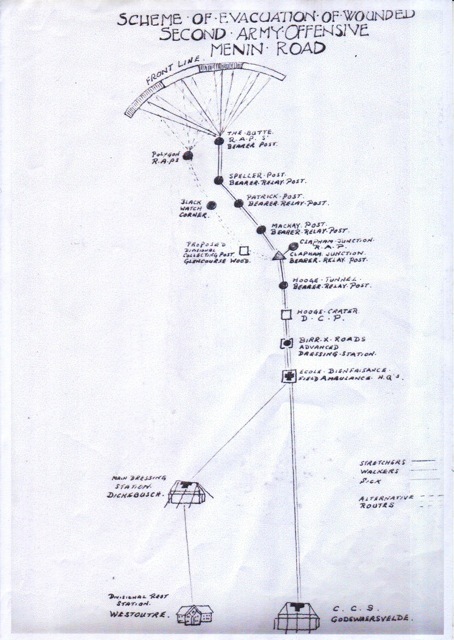 Collecting posts were set up where two or more evacuation routes met on the main route back from the Front lines. 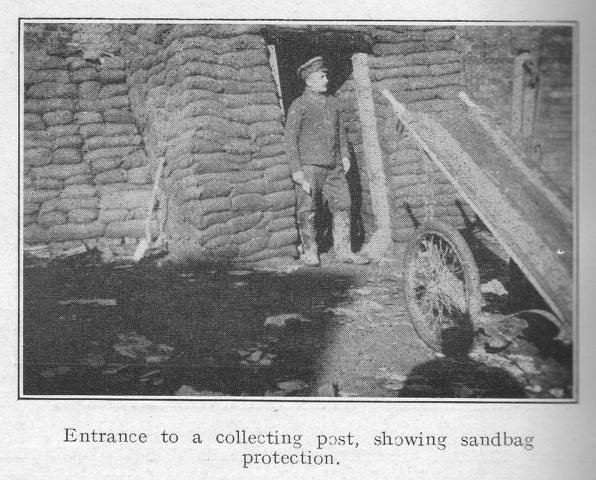 These could be Bearer Collecting Posts, where two or more relay posts merged, or could be set up further away from the front lines when evacuation routes from different Divisions or different Corps came together. Collecting Posts were mainly a holding area for wounded whilst they waited to be collected by either motor or horse transport. Although there were no medical facilities set up at these posts, they were often staffed by personnel from a Field Ambulance section to check dressings and supply a drink or something to eat. The definition and function of the Cavalry Field Ambulance was the same as the Infantry Field Ambulance. The difference is that is was smaller and because cavalry regiments were much more mobile than infantry regiments, their Field Ambulances had to be much more mobile. They would open, treat the wounded, then close and move much more frequently. "In view of the high degree of mobility requisite and the frequent moves that may be necessary, the personnel must be highly trained. Each man must know his job, and must be able to do it speedily. Loading, unloading, pitching and striking the shelter, together with arranging the equipment, must be practiced until this can be done in the minimum of time. An efficient team can establish the ADS in 10 mins"
Their personnel consisted of 6 Officers and 70 other ranks, RAMC. There were four Field Ambulances per Cavalry Division, each sub-divided into two sections; 'A' Section and 'B' Section. "The usual procedure in action is that the ambulance is divided into tent and bearer sections, the former of which establish a temporary hospital of fifty beds some five miles behind the firing line. The bearer section goes forward and gets into touch with the regiment attached R.A.M.C. Officer at this regimental aid post when the cavalry are engaged in reconnaissance. From the aid post they will move cases in light wagons to the temporary hospital...... Professional work for officers consists of emergency operations and quick evacuation of wounded to the lines of communication. It does not burden itself with chronic cases, as it is a highly mobile force and must be ready to move forward at the shortest possible notice in conjunction with the cavalry brigade." Evacuation Zone - Casualty Clearing Station. [CCS]. Non-serious cases - to be returned to duty after recuperation and rest. Serious cases but still fit to travel - to be immediately evacuated back to the base hospitals. Serious cases in urgent need of immediate treatment. Casualties were provided with food and rest, and were prepared for their further journey, which could have been immediate or after recuperation. The main objective was to provide necessary treatment and move patients out as quickly as possible. However, as a result of their evolution and expansion, it became possible for recuperating patients to be retained for up to four weeks before being returned to their units or transferred to a General Hospital via Ambulance Trains or Inland Water Transport (barge). The discussion of CCSs is difficult to generalize because they were the one link in the evacuation chain that radically evolved over the course of the war. The CCS of 1914 was not the CCS of 1918. 1914 and 1915: CCSs mobilized in August 1914 under the title 'Clearing Hospitals'. During the 1914 retreat, the equipment of most of the Clearing Hospitals was still in transit, consequently, they did not start to become fully effective units until early 1915. By this time it had become obvious to the medical services that there was public and professional confusion about the CCS's role. Was it a sorting centre or a hospital as it's title suggested? 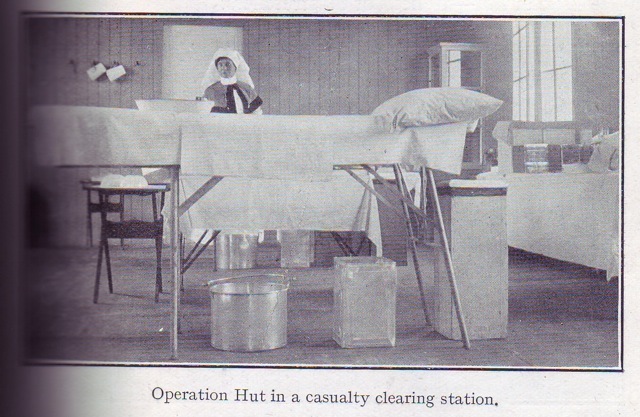 This resulted in their official title being changed to 'Casualty Clearing Station'. In spite of the name change, very high volumes of urgent cases, (i.e, gas gangrene or abdominal injuries) arrived at the CCSs at an alarming rate. Unequipped to deal with this influx, in early 1915, the Director General of Medical Services (D.G.M.S.) approved the increase of surgical work and appropriated extra surgical equipment to be moved forward from the hospitals to the CCSs. By the middle of 1915 it became standard practice for head injuries, compound fractures, and penetrating wounds of the limb to be sent straight to CCSs. 1916: Despite surgery now taking place in CCSs, surgeons began arguing that facilities were required to enable surgery to take place even closer to the Front lines, to prevent a potentially fatal delay in the treatment of infected wounds. Post mortums of abdominal cases had revealed that most had died of hemorrhaging, which might have been avoided by earlier surgery. It was argued that Field Ambulances were not able to provide such facilities because of post-operative care - it was not advisable to move patients immediately after an operation and Field Ambulances were frequently on the move. Also, they were not in a position to provide patients with comfortable beds or nursing care, thus hindering a patients' recuperation time, Arrangements for sterilizing instruments and gowns etc were also more difficult at Field Ambulances. All evidence indicated that the success rate for abdominal surgery was much higher when performed at CCSs rather than Field Ambulances, so all in all it was decided to bring CCSs in as close as 10,000 yards from the Front lines as opposed to roughly 20 kilometers away. This, however, resulted in them now coming under enemy attack, especially from aircraft bombing. 1917: By 1917, more operations were performed at CCSs than base hospitals. From 24th July 1917, the distribution of sick and wounded to CCSs was regulated in accordance of the D.M.S. of the Fifth Army to treat certain types of wounds. 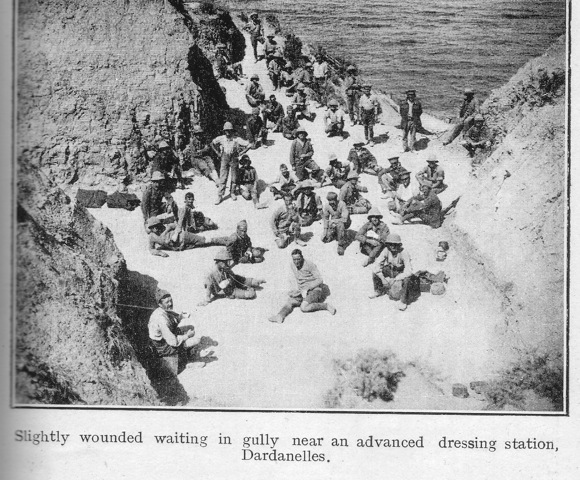 The Field Ambulances became the sorting centres, separating, for example head wounds from stomach wounds at the ADSs, and transporting them to the relevant CCS. Specific CCSs were also allocated to treat self-inflicted wounds, as well as infectious cases, and those who were gassed. Other measures established at CCSs in 1917 were surgical cleaning of wounds before evacuation to the base, the principle of retaining so-called shell shock cases, and measures to deal with mustard gas, which was used by the enemy for the time in 1917. Also by 1917 nursing sisters were successfully trained in the administration of anaesthetics, which was successful and freed up more than a hundred medical officers for other duties. 1918: The spring 1918 German offensive placed the CCSs in danger of becoming part of front line action, which caused them to become mobile again and retreat. By June 1918 they had reduced in size, and many had lost their equipment to the enemy - some sent by transport to a different location, and some taken by the enemy. They were no longer situated on railheads or in other areas designed to promote easy evacuation of the wounded because they had been on the move. By the time of the Allied Counter-Offensive in August, they had recovered their losses, but it was agreed, that although they would be placed as far forward as possible, they must remain sufficiently mobile to keep up pace with any advance or retreat. Personnel: In normal circumstances CCS personnel would included 8 Medical Officers (The C/O, 6 doctors, and 1 surgical specialist), 1 Quartermaster, 7 QAIMNS, and 77 other ranks (working as clerks, cooks, nursing orderlies, theatre orderlies, stretcher-bearers etc.) Often a dentist and a pathologist were attached. Non-medical personnel attached would include 3 chaplains, 4 lorry drivers, 2 Royal Engineers personnel - an electrician and engine hand, and men from the Army Service Corps, employed as ambulance drivers. This small staff was sufficient in quiet times but totally inadequate during battle. In times of heavy fighting, the number of personnel could be increased and specialized by bringing 'Surgical Teams' forward. A surgical team was made up of a surgeon, an anaesthetist, a theatre sister, 2 theatre orderlies, 4 stretcher bearers, and a batman. The extra personnel were brought in from hospitals at the base, or from CCSs and/or Field Ambulances which were not engaged in active operations. Additional nursing sisters were also attached in proportion from 7 to 24 or more. The organization for reinforcements during a major battle gave no provision for additional rank and file, (i.e. men to assist with the unloading of motor ambulance cars as they came in, and loading patients onto ambulance trains.) To meet this demand, detachments of 50 or more low category men, or men from labour companies or other sources, or even convalescent patients were attached to CCSs. Formation/Location: As a general rule there was one CCS per Division. It was found, though, that 10 CCSs were sufficient to treat the wounded in most major offensives. This allowed surplus CCSs to be employed for the reception of sick, infectious diseases, or special cases, such as head wounds, abdominal wounds, etc. 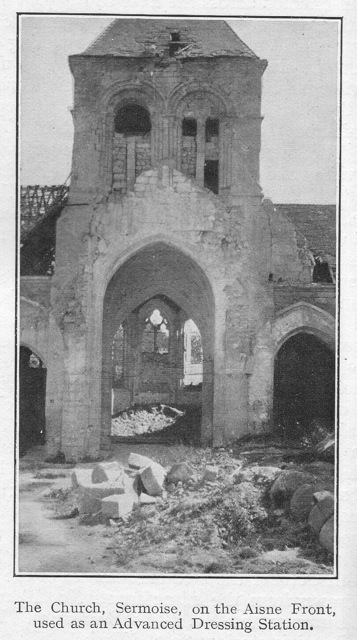 In September 1916, every CCS was divided into a heavy and a light section. The light section was designed to be able to move forward or retire in line with the troops at a moment's notice. A light section was also used to set up Advanced Operating Centres or Abdominal Hospitals. CCSs usually worked in groups of twos or threes, and in relay. 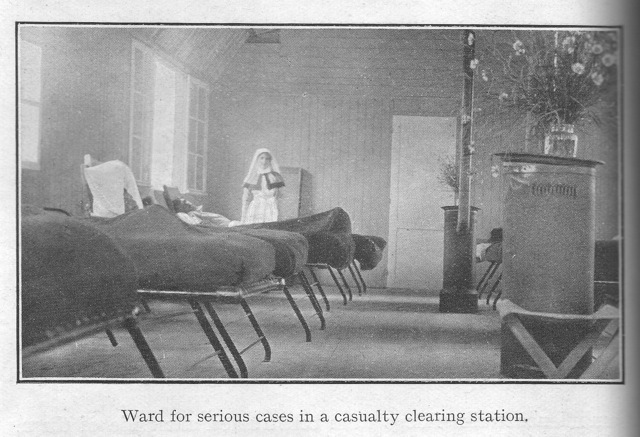 This meant one would be closed and treating casualties for evacuation by train or ambulance to the Base Area, whilst the other would be empty and readying itself to receive new casualties. When the second one became full it would close, but the first would by now be empty and ready to receive new casualties again. A third would only be treating the sick, but would evacuate to receive battle casualties in an emergency. Each CCS took around 150 to 200 wounded before they closed and new patients arriving were redirected to another CCS. Early CCSs were established in buildings, but with the need for expansion, they began setting up on open ground, using tents and hospital Nissen huts. When on open ground they were situated near a railway siding for their own use, with a good road and communication towards the Front. 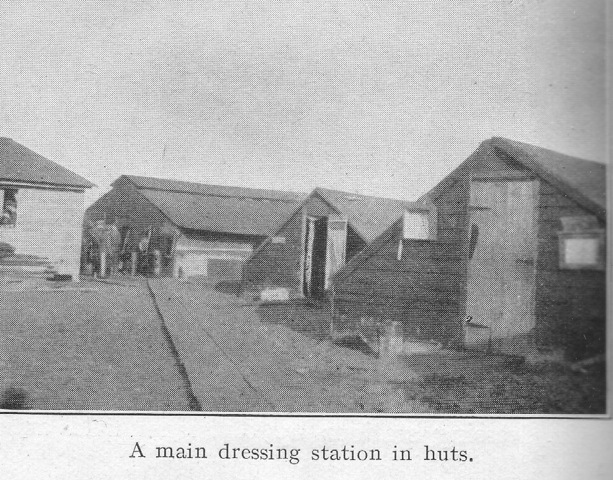 The tents and huts provided accommodation for staff, and wounded, as well as operating theatres, medical and surgical stores, kitchens, sanitation, incineration plant, ablutions, and a mortuary. Portable generators were supplied to provide lighting. The conditions which determined the selection of sites for CCSs were: proximity to railways, good road approaches, reasonable security from hostile artillery fire, and adequate water supply. Capacity: Early CCSs were set up to provide accommodation for 200 patients, however the number of surgical operations being performed by 1917 meant they had expanded greatly, and were able to receive between 800 - 1,200 sick and wounded. The stretcher exchange dump - where the drivers of motor ambulances delivered casualties and exchanged the equivalent of equipment handed in. A general admission tent or hut, or a receiving section - where a patient's particulars were recorded in an Admission and Discharge (A & D) book, and his medical condition was classified by a medical officer. Refreshments such as tea, coffee, hot soup, sandwiches, and cigarettes were supplied here for waiting patients. 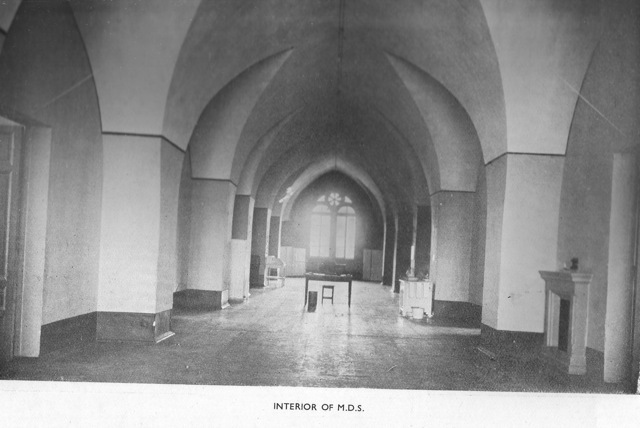 A section for the dressing of walking patients: Here a patient might sit on benches, where he was attended to by a sister and/or orderlies working under a medical officer. A section for the dressing of lying down patients: Stretcher cases were carried here. If the patient's wound was slight, it would be dressed, and the patient was then taken to the evacuation ward. If his wounds were more serious he was passed on to the pre-operation ward. A pre-operation section: Here the patient's clothes were cut away, and he was cleansed, warmed and fed. A resuscitation ward: If on arrival the patient's condition was too unstable for surgery, he was taken to the resuscitation ward, where a medical officer, a sister, and orderlies attended to his revivification. He was rested, warmed, infused or transfused - whichever might have been necessary. X-ray department: There were six mobile X-Ray units serving in the British Expeditionary Force during the Great War and these were sent to assist the CCS's during the great battles. Operating theatre: After 1916 there could be one or two theatres accommodating up to 12 tables arranged in pairs, each pair being divided from the other to provide privacy. Two tables were often provided for each team in order to save time. Surgical teams often worked in groups of 3 for 8 hours shifts with 4 hours off to sleep. This pattern could enable two operating tables to run continuously for a week. In reality, different CCSs worked in different ways. Major Richard Christopher Clarke R.A.M.C. of No 19 CCS stated that during one offensive "The surgeons were to do sixteen-hour shifts with eight hours off, thus giving us four tables going day and night." Evacuation Section: After an operation, the patient could be carried here to await evacuation back to a Base Hospital. As stated above, slightly wounded were sent here after their wounds were dressed. Retention ward: If the patient was too ill to be evacuated, he was taken to a retention ward. These were situated at the back of the CCS in as quiet a place as possible. He was attended to here by the nurses and medical officers. Equipment: In 1914, there were no definite regulations limiting the amount of material and tentage which could be added to CCSs. Individual commanding officers requisitioned for whatever equipment they might consider necessary. However, it was recommended that every CCS have tents to accommodate 200 patients, 210 stretchers, 200 Paillasse cases, 200 bolster cases, 480 sheets, 50 feather pillows, 400 blankets, along with sufficient cooking and feeding utensils, medical stores and comforts, and surgical equipment. Surgical equipment comprised of: 1 small operating tent, 1 operating table, a few wooden splints, and a few yards of aluminum splinting. Doctors were encouraged to use local resources to obtain what they required. In June 1915, a further increase of equipment was authorized and CCSs were supplied with the 'Bowlby Outfit No 2'. Later in the war small operating tents/areas were replaced by a Nissan hut of 60 feet in length and 20 feet in width - room for 4 operating tables and their equipment. Due to the vast expansion of CCSs, it became necessary to regulate the quantity of equipment allocated. The new scale equipment was issued in routine orders. 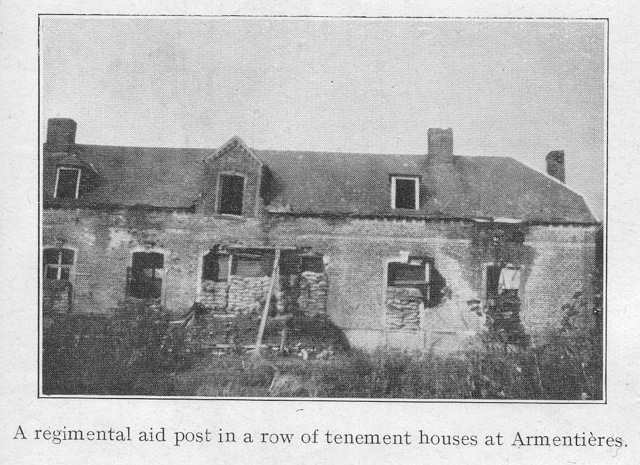 Sets of equipment were kept in reserve at the Base Depot of Medical Stores in Boulogne and was sent up when required. This equipment list is far too large to state here but can be found in Volume II of the Medical Services General Official History and Volume I of the Medical Services Surgery of the War. Transport: There was no scale for transport laid down for the units in 1914 mobilization tables, but a footnote explained that if transport was required it would be furnished under the orders of the Inspector-General of communications. It was advised they should receive 17 general service wagons and 8 or 9 3-ton motor lorries when the unit was on the move. However, after they had expanded it was documented that as many as 100, or even in one case 200, lorry loads or a complete train of goods vans had been used.